Probiotics: Does everyone need more of them in their diet? Probiotics: Does everyone need them? There’s a new food trend that’s taking off and food industry experts say you’ll be seeing more of it – probiotic-enhanced foods. Or foods that have live microorganisms added to provide possible health benefits. Food producers are starting to put them in items such as ice cream, coffee, tea, soups and even beer. And you can find make-it-yourself Kombucha classes at community colleges so people can learn to make the probiotic-rich tea at home. Then, there’s an explosion of over-the-counter pill forms of live bacteria that help balance the natural bacteria in your body. So it begs the question – should everyone be taking probiotics like a multi-vitamin or at least be seeking out foods rich in them? Jamie Weyant, director of Dietary Services at OSF HealthCare Holy Family Medical Center in Monmouth, Illinois, says for average, healthy adults there’s nothing wrong with taking a probiotic. But she emphasizes there are hundreds of strains of probiotics, so an over-the-counter probiotic might not help if you have a specific problem such as chronic diarrhea or bloating. “Not everything is clear cut. They have some recommendations where this strain might help with this problem, but you have to be a smart consumer and look up those studies to see what strain is best for the particular problem that you are trying to solve,” she said. Weyant advises seeking medical advice before taking any over-the-counter probiotics. Over-the-counter pill forms can be expensive. A survey of options of some top-selling probiotic supplements show they range in price from $20 to just under $30 for a two-month supply. And, researchers have not definitely confirmed the health benefits of taking probiotic supplements for a healthy person who eats a balanced diet. “If you’re consuming the live, active cultures and you’re also consuming a healthy diet of the fruit and vegetables and the whole grains, that’s the best case scenario to improve the gut flora,” she said. But for people who pick up a bug while traveling or for patients with irritable bowel syndrome, probiotic supplements can be particularly helpful in reducing symptoms such as abdominal pain, bloating and bowel movement irregularity. Weyant also points out that people who eat highly-processed and fatty foods won’t feel any better by simply taking a probiotic supplement. Yogurt can be part of a healthy diet for growing bodies. In addition to probiotics, yogurt is also rich in protein, calcium, and potassium. Usually, probiotics are not needed for healthy babies. But there is not likely any danger in giving them to infants, according to pediatrician Dr. Ian K. Kang who specializes in gastroenterology at OSF HealthCare Children’s Hospital of Illinois. 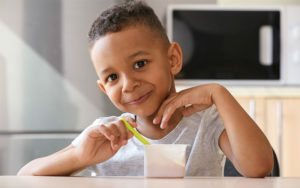 “We give probiotics to children to prevent antibiotic associated diarrhea and to replenish healthy bacteria in children who have inflammatory conditions of the intestine,” he said. “Probiotics are in some manufactured formulas. Or they are available in powders or capsules that you put into drinks or on foods, but they can’t be heated or that would kill the bacteria,” he added. For adults and children, Weyant also has a warning that while probiotics are okay for most, they can pose a risk for some people. “For people who are immuno-compromised or have any kind of medical issues, it is recommended they seek approval from their doctor before taking any supplements. They need to know if there’s any kind of contraindications with their medications,” she suggested. While probiotic supplements are not known to cause any harm, you can achieve proper balance by maintaining a healthy diet. Consult your primary care provider before you: start taking a new supplement or medication, add or change medications or experience any adverse reactions. If you don’t have a primary care provider, you can find one near you by visiting our directory. Colleen Reynolds is a Media Relations Coordinator and joined OSF HealthCare in July of 2018. She spent many years as an award-winning reporter for WJBC and WGLT Radio in Bloomington-Normal and remains active in supporting journalism as vice president of the Foundation for the Illinois News Broadcasters Association. Colleen lives in Bloomington, IL and is also an active member of the McLean County League of Women Voters where she manages the organization’s Facebook page and works to coordinate educational and voter outreach programming. Do sleep supplements actually work?